These are new floppy diskettes. Labels Included. 8x write speed. Portable, slim design. USB 2.0 interface. Discs are multi-colored: red, blue, orange, green circles. BRAND NEW Memorex USB 2.0 Flash Drive 32GB Each - 2 Pack FAST SHIPPING! Wireless Market will do everything we can to resolve your issue as quickly as possible. We will make sure to correct any situation to the best of our abilities. The more detailed the information you provide will allow us to quickly resolve the issue. Memorex USB Flash Drive 32GB each 3 Pack. The compact and sleek design with a sliding collar covers and protects the USB connector when not in use. Factory Sealed! Look at the pictures, what you see is what you will get. Features: Retractable USB Connector. You will get 10 CDs with paper sleeves. Never opened. We do the work. From start to finish, we do it all Professionally photograph each item. Friendly and fast market research on your item(s). 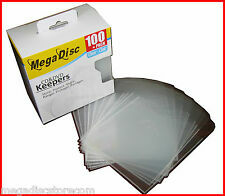 50-pk Memorex CD-R; 52x 700MB 80 min Recordable Discs; Great for Music + Data! Storage Capacity: 700MB / 80 mins. You will be receiving 30 discs. The boxes appear to be in good condition, but due to the fact that they are sealed they are being sold as is. Vintage Memorex 5.25 Floppy Disk Storage Case. Trending at $6.74eBay determines this price through a machine learned model of the product's sale prices within the last 90 days. COMPATIBLE WITH ALL USB PORTS. CAPACITY : 1GB. INCLUDES FLASH DRIVE AND CAP PROTECTOR. THESE ARE THE ACTUAL PHOTOS OF THE DEVICE FOR SALE. 1.44 MB, 3.5" Diskette, High Density. - Rainbow Colors of Red, Blue, Yellow, Orange & Green. 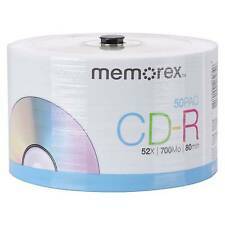 Memorex Recordable BD-R 4x 25BG Blue-ray Disks 15pack. Condition is New. Shipped with USPS Priority Mail. Requires 9 Volt battery not included. CD/DVD markers are designed especially for use on CDs/DVDs. Permanent ink is nontoxic and water-based. Colors include blue, black, green and red. CD/DVD Permanent Markers. Blue, Black, Green, Red. 2045 Niagara Falls Blvd, Unit 4. NEW NIP MEMOREX DVD-R 10PK 16X 4.7 GB 120 Min Factory Sealed. Condition is New. Shipped with USPS Priority Mail. 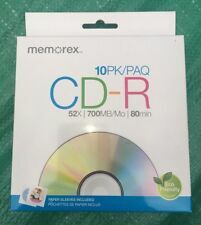 Memorex CD-R 100 Pack 52X 700MB 80 Min Spindle Blank CD Disks. Condition is New. Never opened - plastic wrap still on. PayPal only. No Returns. Shipped with USPS Priority Mail. Holds nearly twice as much as a single-layer DVD. Up to 8X recording speed. 8.5GB capacity to hold more music, movies and data. Size: 50 Discs. 15 Pack New Memorex 6X Logo Blu-ray BD-R 135min 25GB [FREE USPS Priority Mail]. Condition is New. Shipped with USPS Priority Mail Small Flat Rate Box. 8x DVD speed, 24x CD write speed. Slim, Portable Design. Reads & writes to DVD and CD formats. Products shown are sold as is. Easy save function. Orange, Green, Red, Yellow & Blue. Color: Orange, Green, Red, Yellow, Blue. 100 Pieces. We reserve the right to correct any typos. Quantity: 100 Pieces. We reserve the sole right to choose the carriers. MEMOREX DVD+R RECORDABLE DISCS 10-PACK 16X 4.7GB/GO 120 Mins. w "FREE SHIPPING"
Constructed of transparent polypropylene, CD/DVD Keepers allow for easy viewing of the enclosed contents. Transparent polypropylene for easy viewing. Low cost storage solution for your CD's & DVD's. 18 Memorex 3M 2S 2D 2S/2D 5.25" 5-1/4" Floppy Disks 1.6MB. Condition is New. Shipped with USPS First Class Package. Book does not look perfect but was inside sealed box. Memorex USB 2.0 Flash Drive 16 GB Red 32020101621. Condition is New. Shipped with USPS First Class Package. 20 MEMOREX DVD-R 16X 4.7GB 120 Minutes Discs New Blank BULK Pack 20 NEW Condition is New. Shipped with USPS Media Mail. Trending at $27.47eBay determines this price through a machine learned model of the product's sale prices within the last 90 days. 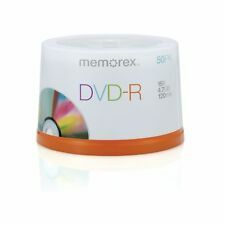 10PK Memorex Printable DVD R Marker - 16x - 4.7GB - 120min. Condition is New. Shipped with Economy Shipping. Item #: 057943. Native Capacity: 700 MB. 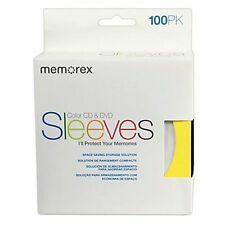 BRAND NEW Memorex USB Flash Drive 32GB Each - 3 Pack FAST SHIPPING! LOT OF 2 BOXES NEW UNOPENED. Item is new, and sealed in box. The plastic overwrap outside the box is torn in a few places, the UPC bar appears to be removed.